SETsquared Bristol not only provides the space and expertise to nurture its own high-tech members growth but also offers valued external support and mentoring to young startups and students in the wider community. One of SETsquared Bristol’s recurring events is #Idea2Pitch, an interactive afternoon workshop that offers expert insight from their Entrepreneur-In-Residence, and equips attendees with the practical tools to devise and hone the perfect pitch for a tech startup in the early stages of development. This demonstrates a real thirst among the wider Bristol tech startup community for this initial early stage support to develop ideas into successful pitches. #Idea2Pitch offers a chance for many to prepare for next level support to meet application requirements for startup incubation programmes, such as SETsquared. Current Entrepreneur-In-Residence, Greville Commins, shared best practice examples and provided invaluable insight that laid the foundation to refine the perfect pitch. This event is crucial for any tech startup looking to make the next step from early-stage development towards gaining entry to more consistent support and mentoring programmes, so if you could benefit from it, ensure that you apply to attend the next session in April 2018. SETsquared Bristol is also working with Bath Spa Global to help deliver a mentorship programme to 25 international students, between 17 and 18 years old, from American University based in Washington DC. The programme offers the students a chance to gain real-world work experience and an insight into leadership and entrepreneurship. 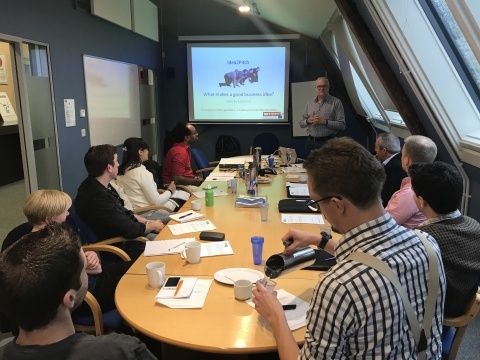 This is achieved by working directly with SETsquared Bristol member startups to undertake market research, after the students took part in an introductory workshop on market research skills by Entrepreneur in Residence, Rick Chapman. This year students have been set the task to complete market research for SETsquared member companies, providing an opportunity to take the lead and deliver impactful recommendations that could potentially influence and advance real-life business development. SETsquared Bristol’s next #Idea2Pitch workshop is due to take place in April 2018. Keep up to date with SETsquared Bristol events and news by signing up to the monthly newsletter here.